Thursday and Friday, November 12 and 13 at 8 p.m.
Saturday, November 14 at 4 p.m.
Sunday, November 15 at 2 p.m.
Thursday-Saturday, November 19-21 at 8 p.m.
On a small island west of Sumatra, Captain Jan van Toch discovers an unusual species of intelligent newts, who multiply quickly and can be trained to use tools - a convenient new source of cheap labor for underwater engineering projects. But what happens when they learn to speak our languages, demand their rights, and build not only dams but also bombs? 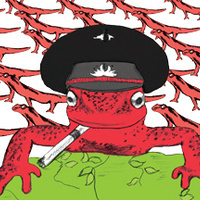 This world premiere adaptation of War with the Newts, Karel Čapek’s satirical 1939 science fiction classic, is a literary “mockumentary,” incorporating fictional newspaper articles and scientific reports. The production promises to showcase Onoda Power’s “nifty visual tricks” and “delightfully unexpected” (Washington Post) solutions for the stage. This production is offered in conjunction with the Embassy of the Czech Republic's Mutual Inspirations Festival and with the Davis Performing Arts Center Center’s 10th Anniversary Celebration.